Today was a busy day and perhaps not the best moment to choose to do a digital collage, especially not when I have as hard a time doing art drafts as I do writing drafts. I can't just do big strokes and leave it at that (I did put my foot down at adding details and textures...). But I'm learning. Boy, am I learning lots with this little project. That alone is quite fun. Original colors (photographed with pretty cruddy light, so...) just so you can see the difference if you are curious. I do think the final version pops more, but it is not at all the palette I want to work with when I settle on a style. 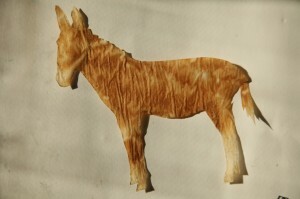 Donkey: Cut-out from waxed paper that had served for baking my last loaf of bread, color change is digital, as are the details: Waxed paper does not like or accept ink. 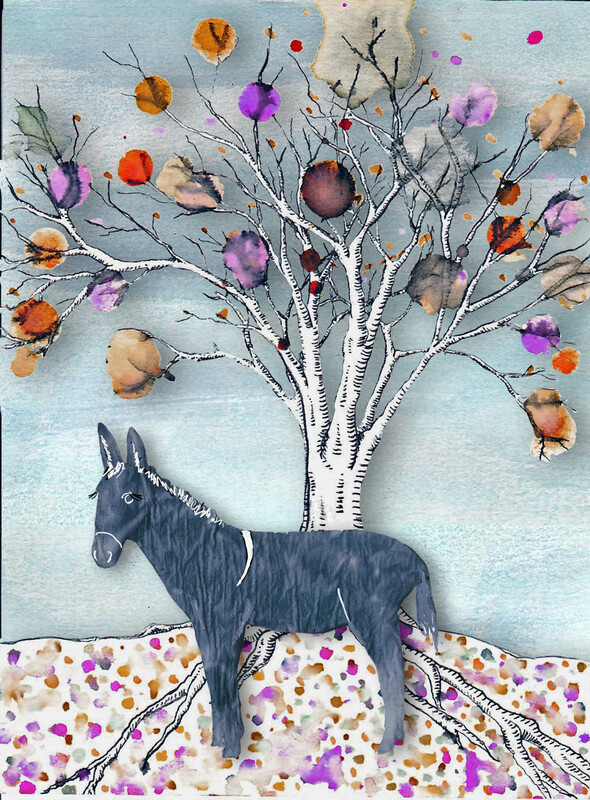 Love that the donkey is made from waxed paper, and I love the homemade watercolor. :D He was a lovely brown color, but with the funky colors that my scanner made the tree details, I had to play to get him to complement as well as stand out from the rest. Time consuming but fun. I think it's gorgeous! 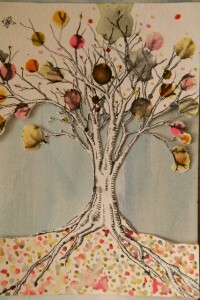 And I love how you are using different materials to cover the same theme. Beautifully turned out. Gentle colors. To me, this donkey looks feminine (the eyelashes?) and very mystical. The bluer tones of the final version emphasize her spiritual powers. Ah the eyelashes! I forgot to post a photo of donkey eyelashes. :D Thanks for reminding me. Wonderful work. This is really appealing. I want a blue donkey. I want a blue donkey. I love watching you work. All of these have been beautiful.